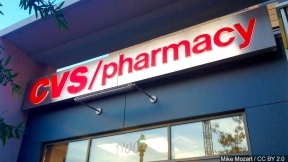 The drug store chain CVS has announced that it is making naloxone, a drug to reverse the effects of opioid overdose, available without prescription at all of its Texas stores. The Dallas Morning News reports CVS also plans to make the drug available at its pharmacies in 31 states by next month. Walgreens announced plans in February to make the drug available at its pharmacies in Texas and 34 other states by last month. Rite Aid, Target and Wal-Mart have joined independent drugstores in either relaxing access to naloxone through their pharmacies in dozens of states or are making plans to do so. The grocer Kroger is also selling it without requiring a prescription in a few states. Naloxone, which is known by the brand-name Narcan, can quickly revive someone who has stopped breathing after overdosing on so-called opioids, highly addictive drugs that include prescription painkillers like Vicodin as well as illegal narcotics like heroin. In the past, naloxone has been available mostly through clinics, hospitals or first responders like paramedics. © 6703 Chicago Hispanic Newspaper, Lawndale News, Hispanic Bilingual Newspapers, Su Noticiero Bilingue. All rights reserved. XHTML / CSS Valid.